Downtown Brooklyn has excellent walkability, is quite bikeable and boasts excellent transit options, according to Walk Score's rating system. So what does the low-end pricing on a rental in Downtown Brooklyn look like these days--and what might you get for the price? We took a look at local listings for studios and one-bedroom apartments in Downtown Brooklyn via rental site Zumper to find out what price-conscious apartment seekers can expect to find in this New York City neighborhood. Here's a one-bedroom, one-bathroom apartment at 228 Flatbush Ave., which is going for $2,290/month. In the fourth floor unit, expect to find high ceilings, hardwood flooring, French doors and generous closet space. When it comes to pets, both meows and barks are allowed. Then there's this apartment at 436 Albee Square West, listed at $2,318/month. The unit features central heating, hardwood flooring, a balcony, a dishwasher, stainless steel appliances, a kitchen island, floor-to-ceiling windows and in-unit laundry. When it comes to pets, both meows and barks are welcome. The building offers garage parking, a roof deck, a fitness center, outdoor space, secured entry and a residents lounge. This one-bedroom, one-bathroom apartment, situated at 1 Duffield St., is listed for $2,625/month. Apartment amenities include both air conditioning and central heating, hardwood flooring, high ceilings, a balcony, stainless steel appliances and a dishwasher. Both cats and dogs are welcome. The building offers garage parking, a roof deck, a fitness center, a business center, outdoor space, on-site laundry and secured entry. Over at 60 Duffield St., there's this one-bedroom, one-bathroom apartment, going for $2,954/month. The building features a roof deck, a fitness center, an elevator, a door person and a residents lounge. In the unit, the listing promises hardwood floors, stainless steel appliances, in-unit laundry and ample natural light. Pet owners, inquire elsewhere: this spot doesn't allow cats or dogs. 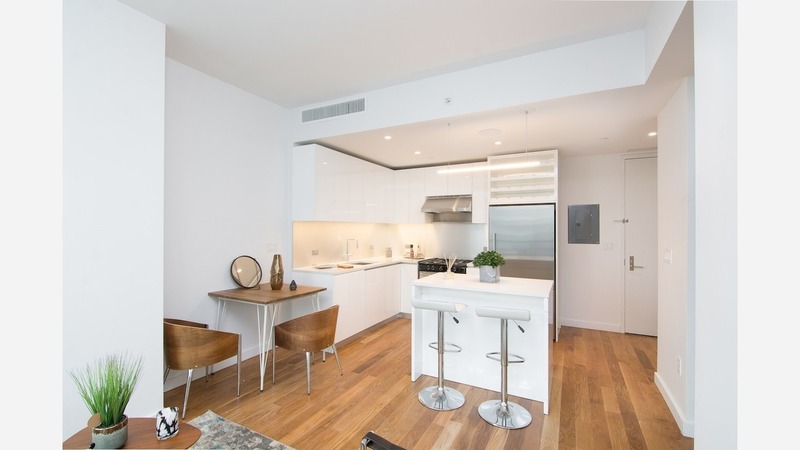 Listed at $2,995/month, this one-bedroom, one-bathroom unit is located at 189 Schermerhorn St.
Building amenities include garage parking, a fitness center, outdoor space, an elevator, on-site laundry and a residents lounge. The apartment features hardwood floors, stone countertops, stainless steel appliances, generous closet space and large windows. Cats and dogs are not welcome here.